A day of labor on the hot, humid day following Labor Day. Six employees from Whole Foods of Chapel Hill, led by two faithful Clean Jordan Lake volunteers (Mark Berman and Nina Verin), scrambled up and down steep, difficult terrain at the Wildlife Resources Commission Fishing Access off Big Woods Rd. Its hard to imagine why fishermen would enjoy to stand among beer cans, plastic six-pack holders, blue plastic bait containers, paper plates, food wrappers, and potato chip bags. Added to this mess were broken fishing poles and yards of fishing line entangled in the bushes. 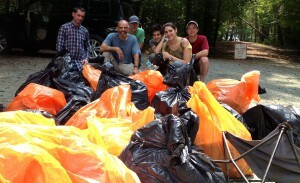 After a few hours, the team had filled 28 trash bags and hauled them off to a Chatham County Collection Center. Congratulations to Whole Foods of Chapel Hill for caring about our local environment. This fishing access can now be enjoyed for its natural beauty even if the fish are not biting. Littering by Fishermen A Serious Threat to Birds!